Throughout its long history, the menhaden fishery has withstood many periods of fluctuation in the fish population (Fig. 6.4). Numerous explanations for these fluctuations involve the age composition of the fishery. Once menhaden enter the fishery, a single year class is harvested by the industry over a four- to five-year period. Because of the length of this harvesting, the failure of an entering year class may be unnoticed, as other year classes are harvested at the same time. 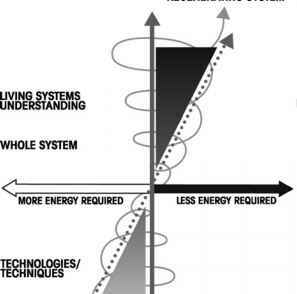 This can lead to serious stock depletion (Nelson et al., 1977). Therefore, a large increase in fishing effort which continues after the year class has been harvested reduces the stock size in subsequent years. This can be devastating to the fishery and the industry, if a large year class is followed by several poor year classes (Nelson et al., 1977). ,1 i llll llil ll finiiiiiiiniiiiiiiii h iiilllll. increasing catch throughout the 1940s (Ahrenholz et al., 1987) (Fig. 6.4). Catch continued to rise through the late 1940s and early 1950s and peaked at a record high of 712,000 mt in 1956. The 1950s have been described as years of stock expansion with a broadened age structure and several dominant year classes (Vaughan et al., 1988). Peak catches in the 1950s were due to an increase in fishing pressure (despite a decrease in the number of vessels), improved harvesting technology, and for the first time, statistical sampling which covered the entire geographic range of the fishery (Ahrenholz et al., 1987; Blomo, 1987; Vaughan et al., 1988). From 1955 to 1968 age 1 and 2 fish made up the bulk of the catch. The mean average age of catch during these years was 1.67 years (Henry, 1971). Large catches of the older age groups were evident only when a large year class, such as 1951 or 1958, was present. The next decade witnessed a different trend. Landings fell in 1961 to 575,900 mt, and by 1962 the dominant year classes of the 1950s had disappeared (Smith et al., 1987; Vaughan et al., 1988). Landings continued to drop and by 1967 the age structure of the stock began to contract. The severe truncation of the stock resulted in a record low catch of 161,600 mt in 1969 (Blomo, 1987; Nicholson, 1975; Smith et al., 1987; Vaughan et al., 1988). From 1964 until the early 1970s, fish four years and older had almost disappeared from catch samples (Nicholson, 1975). Age 1 and 2 fish continued to make up the bulk of the catch (and they still do). This decline in age structure and abundance was attributed to increased fishing pressure (Nicholson, 1971). Noticeable increases in growth rates occurred during this same time period as compared to growth rates in the late 1950s and early 1960s. These age-specific increases in length and weight are documented as the result of the decrease in the average age of the menhaden stock (Nicholson, 1975). Although an estimated 80 to 90 percent of the potential spawners were being taken by the fishery, the Atlantic menhaden supported a large commercial fishery during the 1970s (Ahrenholz et al., 1987). Speculation about the regrowth of the population under these conditions has centered on either of two views: (1) certain basic aspects of the reproductive biology of Atlantic menhaden were altered because of fishing pressure, resulting in reduced size and average age of the stock (no evidence for marked changes in reproductive biology was found, however); and (2) favorable environmental conditions for recruitment over a period of years allowed for better recruitment and a stable fishery, in spite of the heavy dependency on the age 2 year class by the spawning stock and the fishery (Lewis et al., 1987). The mid-1970s represented a period of temporary decline (in the midst of an overall increasing trend) with landings fluctuating between 365,900 mt in 1972 and 250,000 mt in 1975. This decline was hypothesized to have resulted from climatic and environmental conditions which affected fishing operations and the menhaden stock, as well as from changes in market demand for menhaden products (Blomo, 1987). During the late 1970s, landings remained above the 340,000 mt level and continued to climb (Blomo, 1987; Smith et al., 1987; Vaughan et al., 1988). In 1980 the stock showed signs of strengthening and significant expansion - 401,500 mt were landed. Landings in 1983, the highest since 1962, reached 418,600 mt. They fell, however, in 1986. Rather than a decline in stock abundance, this decline was more a reflection of socioeconomic conditions (Smith et al., 1987; Vaughan et al., 1988). Menhaden have been used as fertilizer as far back as the early 1600s. The name menhaden is derived from the American Indian word Munnawhatteaug, meaning "fertilizer" (Frye, 1978). According to legend, the American Indians helped the European colonists to avoid starvation by teaching them how to use whole menhaden to fertilize their crops (Blomo, 1987; Hu et al., 1983). Documented evidence, however, supports the view that Squanto, a native New England Indian, simply introduced the use of fish as a fertilizer to the European settlers in Plymouth from his contact with other Europeans already using this agricultural practice (Ceci, 1975). In any event, the use of whole fish as fertilizer in the US became popular and widespread, when crops failed on Long Island and along the New England coast (Harrison, 1931). From colonial times into the 1800s, the principal value of menhaden was derived from its use as fertilizer. New England fishermen also utilized great quantities of menhaden for bait, sparking a substantial trade (Ellison, 1951). Growth of the fishery as a whole-fish fertilizer and bait trade, however, was limited. In the early 1800s, haul seines, and sometimes gill nets and traps were used by small companies to collect menhaden for fertilizer production (Harrison, 1931). It was not until the introduction of the purse seine in Rhode Island in 1845 (Frye, 1978) that the fishery had a chance for expansion. Successful usage of the purse seine spread down the coast to Virginia by 1869, and remains today as the most common gear used in the menhaden fishery. It was, however, the discovery of the valuable menhaden byproducts, such as fish oil, that actually turned the fishery into a major industry (Harrison, 1931). Centuries after the French and English produced oil and fertilizer from fish, the menhaden oil industry began in the US. In 1811, the first menhaden plant was opened in Rhode Island. Replacing whale oil, menhaden oil was used for tanning and curing leather, for the production of margarine and shortening for European markets, and as an ingredient in soap and paints (Frye, 1978; Hu et al., 1983). Following the introduction of the purse seine, the use of the first curb press in 1856 added the ability to produce a greater yield of oil and a drier residue in the processing industry. The implementation of steam cooking at this time in combination with these technological advances prompted the development of steam factories as well as major expansion of the menhaden fishery along the Atlantic coast. By 1866 steam plants had been established from Maine (24 plants) to North Carolina (three plants) (Ellison, 1951; Harrison, 1931). Not until the late 1800s, however, was the dried fish scrap utilized as a marketable commodity in the form of domestic farm animal feed (Blomo, 1987). By the turn of the twentieth century, the primary use of menhaden had changed from fertilizer to feed for poultry, swine, and cattle. The use of oil expanded to include the production of linoleum and waterproof fabrics (Hu et al., 1983). The growth of the industry was concurrent with advancements in the technological aspects of the fish reduction process. Continuous steam cookers were replaced by steam cooking tanks; the press evolved from a lever press to a hydraulic curb press and eventually to a screw press. Other aspects of the reduction process included the replacement of solar evaporation drying techniques by a ro tary flame drier, and the introduction of acidulation (commercial sulfuric acid) used in the preservation of the "chum" (scrap). As pressed fish putrefy rapidly, the introduction of an acid preservative was a major advancement overall in the industry and sparked the development of the fish-scrap industry. Steam-powered vessels, some built especially for menhaden fishing, increased fishing capacity by bringing fishing areas within easier reach and also enabling catches to arrive at the factory sooner, which meant that fish arrived in better condition. Together with the improved technology of the reduction equipment, powered vessels led to the construction of larger factories along the coast, many of which are still in existence today (Harrison, 1931; Hu et al., 1983). By 1929, there were 37 factories in operation along the Atlantic coast utilizing an estimated 180 million kilograms of fish, with meal, oil, and scrap products valued at close to US$4 million. At this time the menhaden industry employed approximately 4,500 people earning over US$2.5 million (Harrison, 1931). The decline in menhaden catch during the end of the 1920s caused menhaden by-products to decline in the rank from first to third, giving way to the expansion of the freshwater mussel and pilchard by-products industries (Harrison, 1931). Prior to World War II, the primary by-products of the fishery were dried fish scrap for fertilizers, and fish oil for fuel and industrial processes (June & Reintjes, 1976). After the War, the growth and rapid expansion of the poultry industry and the decline of the California (Pacific) sardine industry generated an increased demand for menhaden fish meal (McHugh, 1981; Vaughan et al., 1988). Concurrently, the industry expanded and technology advanced. Larger, more efficient processing plants with greater capacities were supplied by faster, larger (>300 net mt) carrier vessels now being equipped with refrigerated fish holds. Spotter aircraft were used to locate schools of menhaden and new nylon purse seines were closed with hydraulic power blocks. Processing plants were established along the coast of the Gulf of Mexico by Atlantic coast companies (Vaughan et al., 1988). fish in the 1970s allowed some of these plants to reopen (Nicholson, 1975). In 1972, only two plants, one in Rhode Island and one in Massachusetts, were operating. By 1975, the Rhode Island plant had closed, and the Massachusetts plant was joined by two plants in Maine. Menhaden were still caught in Rhode Island but were trucked to Portland (Maine) for processing, until this plant was closed in 1983. At that time, processing plants in the North Atlantic region were all multi-species plants. Fish from the New England trawl fisheries were brought in and processed. In the summer and fall, when menhaden were locally available, the trawlers were converted to purse seine fisheries (Smith et al., 1987; Vaughan et al., 1988). By 1986 all the plants in the North Atlantic region were either closed or temporarily inactive. And by 1988, all factories in this area had been closed, not, however, because of an absence of fish as was the case in the 1960s, but because of social conflicts. New England had become a densely populated area year-round, not only seasonally as in the early 1900s when factories ceased operation of odorous driers for summer residents. This demographic change, coupled with an increase in coastal property value, coastal development, and increasing demands for recreational areas, led to additional management restrictions corresponding to these shifting economic conditions. The resultant decision by the fishing industry was to close these plants and to reduce the size of the fleets (ASMFC, 1986). In the mid-Atlantic region there were five active processing plants during the 1950s and 1960s (Fig. 6.5). Only one New Jersey plant remained in operation through the 1970s. It closed in 1981. There was a decrease in the number of processing plants in the Chesapeake Bay area through the late 1960s and 1970s because of industrial consolidation (Fig. 6.5). By 1973 and until 1985 only two plants were active, both in Virginia. The active plants during the mid-1960s acquired vessels more efficient in carrying capacity and speed, and the fishing season was extended until November and December. This continued until the 1980s with plants in the Chesapeake Bay area (Virginia) harvesting fish as far south as Cape Hatteras (North Carolina) and, after 1983, north into the North and mid-Atlantic regions (Nicholson, 1975; Smith et al., 1987). single plant in Fernandina Beach (Florida) was active from 1972 to 1986 but suspended operation in mid-1987 (Smith et al., 1987; Vaughan et al., 1988). For the entire Atlantic coast, the number of menhaden processing plants decreased steadily (Fig. 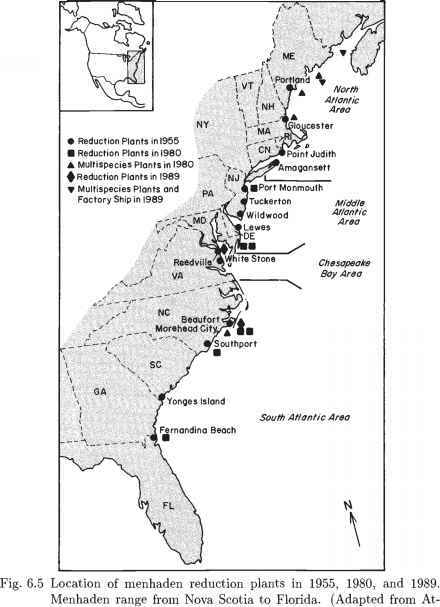 6.5), with little fluctuation, from 23 plants at 16 ports in 1955 to 11 plants at six ports in 1980 (seven of these 11 plants processed only menhaden; the others were multi-species plants). By 1984, only eight plants at five ports remained (ASMFC, 1981; Vaughan & Smith, 1988). Most of the plants were owned by four major companies (Hu et al., 1983). By 1989, only three plants remained at two ports (Reedville, Virginia, and Beaufort), in addition to a Russian factory ship operating off the coast of Maine (that is supplied by American vessels) and a multi-species plant and cannery off the coast of New Brunswick (Canada).